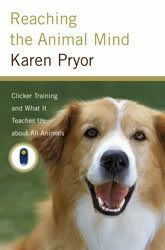 Reaching the Animal Mind: Clicker Training and What It Teaches Us About All Animals by Karen Pryor (ISBN 0743297768) is destined to be another animal training classic. As with some of her past works (Don’t Shoot the Dog! : The New Art of Teaching and Training, Lads Before the Wind, Karen Pryor on Behavior) this book takes complex training topics and chisels them down into easily understood concepts woven into a tapestry of story telling that is both engaging and compelling. This work is easily read and explains principles behind clicker training and behavior modification concepts and illustrates them through engaging stories. Readers can also access videos of some of the animals and training sessions mentioned online by visiting the Reaching the Animal Mind website. Rarely does a book entice me to read it all in one sitting but this one did–in fact I read it a few times. I highly recommend it for not only dog training enthusiasts but also pet owners seeking who are seeking a different approach to communicating with their animals. This book is something I would also encourage television dog training show addicts to read so that they can make the shift into modern dog training instead of following the long standing traditional methods. This chapter begins by leading into a discussion about how animal training (as it traditionally has been done) is now obsolete since training technology has been refined. It talks about how modern training methods enhance animal and human communication. Karen Pryor’s experience with D’Artagnan (a wolf) made me smile because training wild animals is indeed different and the moment he figures out what she wants was a familiar experience I’ve shared with many an animal. This chapter includes a succinct introduction to two schools of behavior science and the influential scientists, Konrad Lorenz and BF Skinner. Also, if you are not familiar with Karen Pryor’s history, readers will get a good feel for her curiosity and willingness to explore from the very first pages. It is true that you can train everything–and so I enjoyed Karen’s hermit crab training story because it illustrates the potential for enhancing the life of any animal. So here’s what I see. come and have a look. If you find it useful, good. I am pretty sure you will find it fun. Training dolphins and the nuances of dolphin training dominate this chapter. One of the great things mentioned is how trainers have to consider the perspective of the animal when progress is slow. So true–but many miss this important point. She hits some other valuable points such as the fact that many novice trainers rely on food lures instead of shaping the behavior. OR that some trainers fail to mark the decision of the animal to commit and only mark the action. This is an important training nuance and I am happy to see it explained. Training groups of animals, how raising criteria works, and cues/cuing are other topics discussed. The “light bulb” moment in the ferret training story is a great one that illustrates how excited animal get when they realize that they have control over good things that happen. If you have ever seen that from an animal you know it really is something, but if you haven’t, this story gives you an accurate picture and I am looking forward to seeing the video online! But this chapter also gets into how to communicate with cues and how to shape behavior in your daily actions–such as at an animal shelter. Some of the important concepts discussed here are the extinction curve, how to shape behavior, and the importance of assigning a cue. Controlling misbehavior by putting it on cue and chaining behaviors are just a couple of the other topics in this section. However, what I loved most was the story about the kids and their pony training. Karen Pryor continually hits topics of importance such as the fact that people miss (or misinterpret) what an animal is communicating or what the animal is conveying. Here you’ll read some interesting observations but what I really liked is the section on Anecdotes vs Observations. There is a lot of prejudice in the scientific community and I appreciate how Karen Pryor discusses the topic. In addition, her “fish tale” gets the point across about how all animals can exhibit emotion. Even non-trainers will get great joy in reading about the creativity and games that dogs, fish, gorillas, and dolphins exhibit in the stories within this chapter. It is my belief is that training gets animals to think in a different manner and that it sparks a variety of activities–each of the stories highlights those possibilities. My favorite in this section is Karen Pryor’s discussion of Hardwired vs. Softwired. There are more stories about animals who exhibit unique processes but what I liked seeing was the brief explanation between working predator and prey animals. I’ve found the two to be vastly different from each other and Karen Pryor does a good job in discussing a little of this while illustrating that each has special dispositions in training. Unfortunately many people dismiss animal memory and friendships. Here Karen Pryor gets into discussing those attachments, friendships, and social dynamics between animals. When you read it I am sure you will recognize (or remember) similar stories from those animals you have known. Fascinating stories studying schools of wild spotted dolphins dominate the content within this chapter. Misinterpretation or missing what an animal expresses are discussed within these pages. Reducing fear, successive approximation, and how giving an animal a cue for a behavior so it can push through resistance are just a few other important topics. But the poisoned cue is the concept I thought would be very valuable to those working with shelter animals or animals trained by more traditional methodology. This is a great chapter that shares how the training dialog is exchanged between the human and the animal. One of the reasons I enjoy training so much is that it enhances the communication between species. Training novice animal is different from training veteran animals and Karen Pryor shares many stories (including those about an elephant, guinea pig, and cat) but the story about Josphine the dolphin is the one that made me laugh. I’ve worked with some veteran animals that behaved in a similar manner–and anyone else who has done so will relate to the story as well. If you had any questions on your mind about clicker training–you might find it here. In a previous post I mentioned the Voice vs Clicker study and a discussion about it is included in this section along with some of the most common questions and confusing assumptions. Discussions about praise, suppressing behavior, correcting mistakes and more will keep you glued to the pages. When I read about the laughing rats in this chapter it brought back fond memories of the rats I had to train for “rat review” in college. They were playful, fun loving and mischievous little guys and laughed a lot while they tried to get me to take a break from studying. Anyway, I always love when I learn something new and if you do too–this is a chapter you will get a lot out of–from the science side of things. The Amygdala Involvement and why the clicker is so powerful was that something new for me. Now if you have ever encountered an animal that is afraid of the clicker or wanted to know about the nuances of cues, the different reinforcers, and more science behind training–this is where it is. Coaching with a click is called Tagging and I have to say that I get a lot of laughs when I’ve clicked a human client–but some people get really worked up over it. So, you’ll learn about how TAG (TAG is an acronym for Teaching with Acoustical Guidance.) helps people get comfortable with the process and learn how it is working to help athletes and autistic children. Real life examples of cooperative behavior fill these pages. Interesting stories about Peace Corps hostages, Brazilian dolphins and fishermen, Guide Dog training changes will keep your interest. They all illustrate change that was brought about through positive reinforcement and will get you pondering. Find Out More, Glossary, and Do it Yourself are great resources for those who want to find reference works and get deeper into the meanings of some of the terms included in Reaching the Animal Mind. Exercises are included in the back for those curious enough to want to try a few things out with instruction. Will clicker trainers and TAG teachers change the world one click at a time? In the meantime I recommend you order a copy of Reaching the Animal Mind: Clicker Training and What It Teaches Us About All Animals by Karen Pryor (ISBN 0743297768). It should be in stores by mid-June 2009.